» Stamp Simply Clear Stamps – Our Spring Release is Here! Stamp Simply Clear Stamps – Our Spring Release is Here! 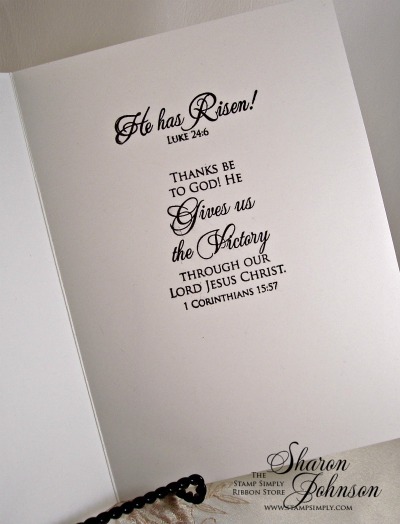 Welcome to our week of inspiration filled with Easter & Blessings! 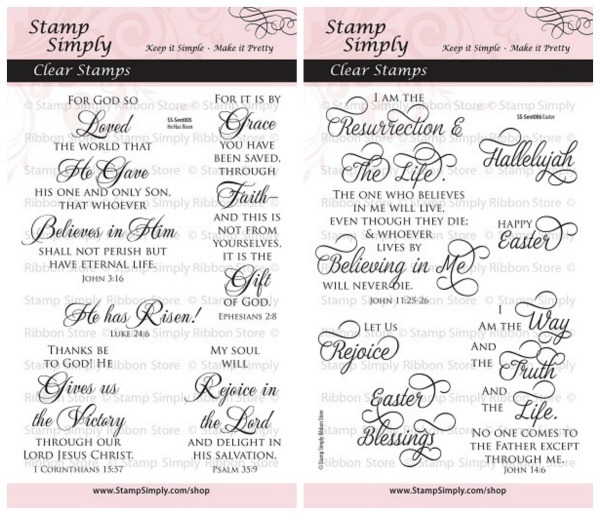 I’m SO happy to pop in here today and let you know that our Spring Release of Stamp Simply Clear Stamps is in the house and ready to roll out! To celebrate our release the Design Team will be using these sets all week long (and even beyond), to bring you tons of inspiration, not only for Easter creations but year-round creations as well. This release focuses on beautifully scripted verses from Scripture. One can never go wrong when using Scripture, whether you are creating a project for this Easter or just needing a card to uplift or encourage someone, nothing can do it better than God’s Word. Each of these sets is done up in a different font, both simply gorgeous! These sets are perfect for the Easter season, but as we know, there is no right or wrong season when it comes to using Scripture. These are truly year-round stamp sets that I think you’ll enjoy! These sets can be purchased individually or together as a Combo Offer to give you even more savings. Again, these sets are offered in a beautiful font. They are companion sets that go beautifully together. Additionally, both the font and themes of these sets partner up with two of our previous sets, Birthday Blessings and Deepest Sympathy. There’s a lot of themed cross-over here so you can combine all these sets to create even more personalized messages on your projects. These verses are taken from The Beatitudes and were broken into two sets as there were too many to fit into one set. 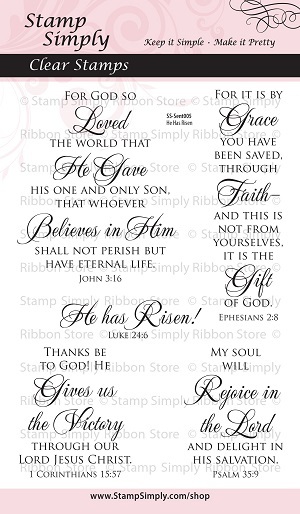 The verses in these sets offer wonderful words of encouragement for a variety of situations. I know there are certain situations where we’d all love to send a card, but often the words are hard to come — what can I/should I say, is often our thought. Hopefully these sets will help you to say just the right thing at just the right time! Again, these sets can be purchased individually or together as a Combo Offer to give you even more savings. And we’re offering Blog Candy today, too — so be sure to read all the way down to the bottom for those details. Isn’t it pretty! All my favorite things together on one card. This card is a bit larger at 6.5 x 4.75″. I’ve always liked this size. It just gives me a bit of extra room to add all I want without looking too crowded. Also, this size fits perfectly into an A6 Clear Box, perfect for both protecting and presenting your card. And this is the card inside. I used 2 more stamps from the same set to create the inside sentiment. Botanica by Kaisercraft – GORGEOUS sheets for spring!!! 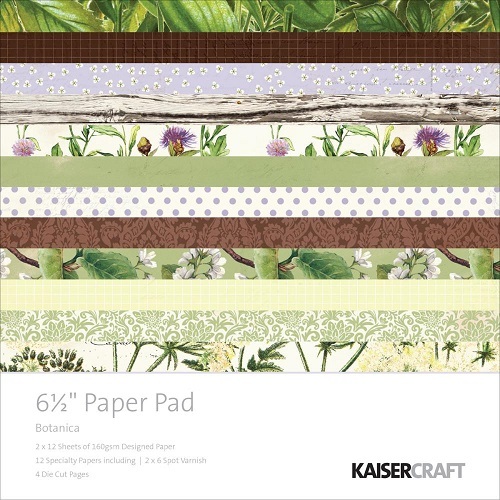 Find all 6.5″ paper pads in stock by Kaisercraft here. It’s no secret that May Arts Silk Ribbon has been my go-to ribbon for years, and it still is. I truly love it! Our silk ribbon is available in 29 colors, 3 widths, in cut yardage, by the full spool, or in sampler packages. Find all silk ribbon here. And next to the silk ribbon, this Venice Lace is my next true love in the ribbon world! It’s SO easy to dress up any project with a bit of Venise Lace. Run a strip of Scor Tape across your project, apply lace – easy-peasy and DONE! 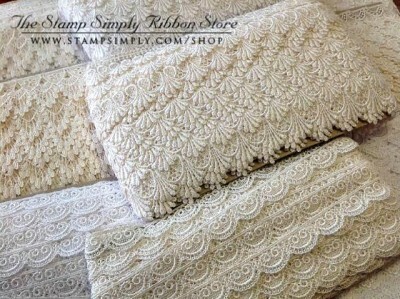 Find all Venise Lace in stock here. Simply leave a comment on this post telling us one of the greatest blessings in your life! All comments through midnight EST Saturday, March 12 will be considered and a winner will be announced next Sunday morning, March 13, selected by a random number generator. ALL Penny Black stamps are REDUCED – up to 40% OFF!!! And please check in each day this week as our Design Team has so many gorgeous projects to share with you using these new sets. My greatest blessings are my husband of 45 years and our daughter. Knowing our Lord and Savior, and the peace that comes with knowing God’s grace and mercy. My loving, supportive husband, and my wonderful son. My greatest blessing is surviving my law enforcement career with my health, my family and hopefully decades in which to enjoy my upcoming retirement in April. Stamping and card making have been my therapy!!! My greatest blessing are my relationship with Christ and my three dear grandchildren. Your stamps are beautiful. The greatest blessing I have is the grace of salvation through the Lord Jesus Christ. My greatest blessing is the promise from God. I know he keeps all of us in his watchful eye even though we are sinners. He hasn’t given up on me or anyone he looks out for us especially when we can’t look out for ourselves. My greatest blessing is my husband, although my grauddaughters probably tie with him! how can I stop at just one blessing?! there are soooo many. Today I’ll mention my husband of almost 10 years. we knew each other from my high school days but didn’t marry until 30+ years later! yeah, he’s my blessing. My blessings are many! My husband of almost 59 years …our anniversary is April 27, 2016. Our three children, five grandchildren , and one three month old great grandson. Our faith and love is strong. God is Good! My Blessings are great! I’m 3 1/2 years free of Breast cancer!! I have a very loving and supportive family! Yes, God is Good!!! And Blessed to have found stamping as my craft of choice. I absolutely love your store and blog. 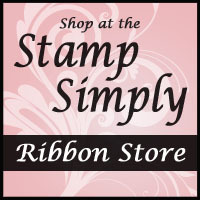 You organize everything beautifully and sell gorgeous ribbon, lace, stamps and more. 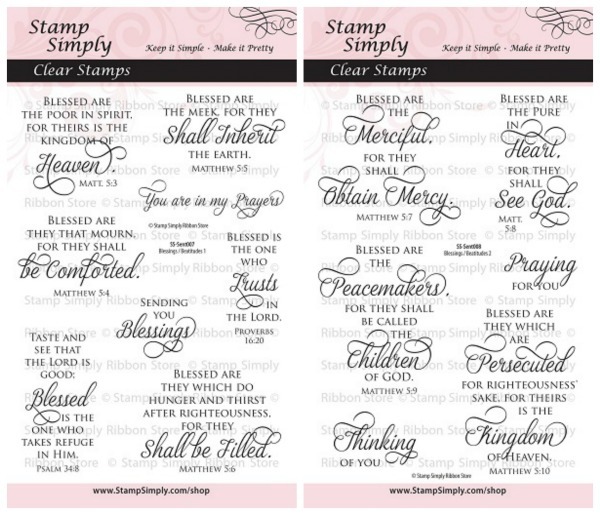 Thank you for the opportunity to win the stamps that quote the Words of Life-Scripture. We buried my brother Friday past and in that the Lord has blessed me with so much love thru people and life lessons. I can now encourage people better when experiencing loss. What a sweet and caring God we have! What a beautiful card you have created! The Lord blesses me every day in many ways. Salvation through our Savior, Jesus Christ, is the greatest blessing of all. 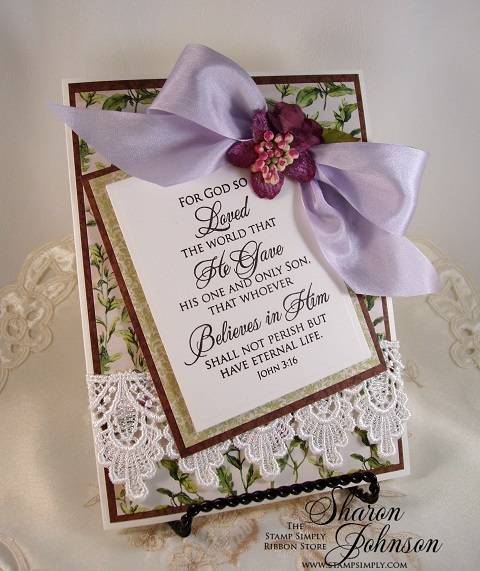 Beautiful card–love the lace trim. One of the greatest blessings in my life are my grandchildren. I just love this card but I love all of your cards… just stunning… My greatest blessing is my family… each and everyone of them. gorgeous card!!! love the verse and the paper you used. my greatest blessing is my family and my church. Your blog is so inspiring in many ways! Scripture always interests me, and the ribbon is gorgeous, an the cards you post are beautiful each in its own style and way. Your awesome store and blog have been so well set up. Thanks for the chance to win one of these great stamp sets. That strip of lave is perfect with your sentiments!! Love your card and the beautiful scripts. My greatest blessings are my children and grandchildren and of course, my DH. The verse, the lace, the ribbon , the bling are stunning. Greatest blessing is God’s love toward me. Blessings for family, friends, clothes, food, shelter and his hand to hold me as i travel my journey on earth.